The LFD provides budget and data analysis to the Montana Legislature including fiscal analysis of state government, estimates of state revenue collections, analysis of proposed executive budgets, and analysis of final legislative budgets. DPHHS is the state agency responsible for improving and protecting the health, well-being, and self-reliance of all Montanans. On the DPHHS website there is information about government programs and services such as Medicaid, Children’s Health Insurance, and Supplemental Nutrition Assistance Program in addition to health data and statistical reports. In addition to forms and resources for taxpayers, the Department of Revenue produces comprehensive reports that provide an overview of Montana’s various taxes. DLI is the state agency focused on Montana’s labor market. Data available includes state statistics on employment, unemployment, and wage information. Montana Code Annotated provides access to all of Montana’s current laws. This is the homepage for the Montana State Legislature with information on current and past legislators, bills, and committees in addition to the work of legislative interim committees. The OBPP is an office under the Governor's Office that provides fiscal advice to the Administration, implements fiscal policies of the Governor, and oversees the fiscal management of state government. This is the homepage of the Montana State government with links to every state agency. OPI is the state agency responsible for K-12 education in the state. Information on this website includes data and statistics on Montana schools and student achievement. Montana KIDS COUNT is a resource for data on child and family wellbeing in the state. They are housed in the Bureau of Business and Economic Research at the University Montana and are a non-profit, non-partisan organization. They provide information on the status of children in relation to health, social, economic, and education indicators. County specific data is also provided. BBER is a research department within the School of Business Administration at the University of Montana, Missoula. They produce a variety of economic and industry data including annual economic forecasts for the United States as well as Montana, its industries, and counties. 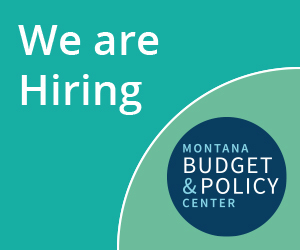 The Center on Budget and Policy Priorities is one of the nation’s premier policy organizations working at the federal and state levels on fiscal policy and public programs that affect low- and moderate-income families and individuals. Since 1969, CLASP has been a trusted resource, a creative architect for systems change, and one of the country’s most effective voices for low-income people. The Economic Policy Institute (EPI), a non-profit, non-partisan think tank, was created in 1986 to broaden discussions about economic policy to include the needs of low- and middle-income workers. The Institute on Taxation and Economic Policy (ITEP) is a non-profit, non-partisan research organization that works on federal, state, and local tax policy issues. The Tax Policy Center is a joint venture of the Urban Institute and Brookings Institution. The Center is made up of nationally recognized experts in tax, budget, and social policy who have served at the highest levels of government.